When my husband and I started planning our honeymoon, we decided we wanted to go somewhere different; somewhere that wasn’t a typical honeymoon destination. I chose Croatia and he picked Malta. Both uncommon, both unique and both filming locations for Game of Thrones (yes, we are big GoT fans). Croatia had been on my bucket list for a long time, but to be completely honest, Malta had never really crossed my mind. It’s a little surprising, too, considering I have family from Malta, and many of them still vacation there during the summer. As a result, I was a little unfamiliar with the country, with the exception of the Knights of Saint John and the Maltese Falcon. For many people, those are probably the only things they associate with Malta, too. But there is so much more to this small, yet significant island nation. Malta is a collection of islands in the central Mediterranean between Sicily and the North African coast. The country consists of three islands: Malta, Gozo and Comino. Its location has given it strategic advantages over the years, and it has been ruled by many different powers, including the Romans, the Moors, Sicilians, Phoenicians, French, British and Spanish. All of these civilizations left their marks on the islands. It’s this wide range of cultural influences, combined with the striking medieval architecture and some of the oldest known structures in the world that have led people to call the islands an open-air museum. Due to the relatively small size of the country, we had the chance to explore a lot of the islands in a short period of time. Despite being small, Malta manages to deliver a varying degree of landscapes and cities, each extraordinarily different from the others. While Valletta may be considered the main attraction in Malta, the villages and towns of the islands play a huge role in the country’s cultural landscape. Each village is defined its unique character. We had the pleasure of staying in my uncle’s flat in St. Paul’s Bay, one of Malta’s largest seaside villages. Named after the Apostle, St. Paul’s Bay started as a small fishing village nestled in an alcove. It offers wonderful open sea views and a subtle yet active nightlife. The flat is located right on the water, and it was lovely to enjoy a cup of coffee and locally made pastries while sitting on the patio overlooking the bay. During the summer, St. Paul’s Bay is bustling with activity, mostly from foreigners coming in for summer vacation. We visited in mid-September, when things are much more quiet and peaceful. We thought it was a little odd that the streets were practically empty in the evenings, but at the same time it was nice not having to deal with crowds of people. We had our pick of restaurants, no reservations needed and no wait time. Our favorite meal was at La Buona Trattoria Del Nonno. We sat out in the garden, next to a small gold fountain. They offered us a complimentary appetizer and prosecco, and it really set the tone for a great evening. Steve ordered the Fish & Chips, a house specialty, while I had the Ravioli di Casa. Yes, we were pretty boring with our orders, but the menu is full of fresh pasta, seafood and char grilled meats for those feeling a little more adventurous. My family also recommended the 1930’s Carpentry Wine Bar. While we didn’t make it there, we passed it a couple times going to and from the flat, and it looked absolutely adorable. 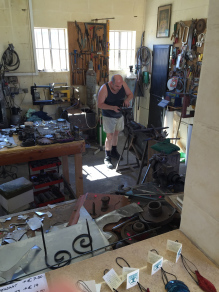 It’s housed in a traditional Maltese dwelling that was once used as a coffee shop, and now it’s filled with old carpentry tools and machinery dating to the industrial revolution. I would recommend it for sure, despite not actually eating there myself. The village is very walkable, but the streets are pretty narrow in spots, and they do drive on the opposite side of the road. We had to keep reminding each other which side of the road we needed to be on to catch the bus. Malta’s bus system is very intricate and easy to use; you can pretty much get anywhere you need to go by taking a bus (or walking). On the coast of St. Paul’s Bay, you can visit the Parish Church of Our Lady of Sorrows, built in 1617 and carefully restored after being heavily damaged in World War II. Near the parish is the Wignacourt Tower, built during Grand Master Alof de Wignacourt’s reign. 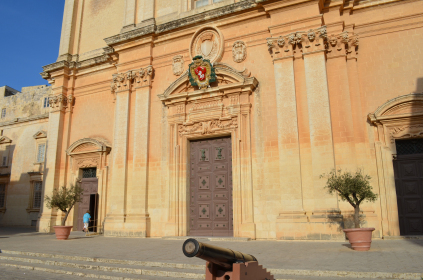 It houses a small museum showcasing Malta’s military and architectural heritage. If you have time, you can take a boat over to St. Paul’s island, where legend has it that the Apostle was shipwrecked. A short walk (or bus ride) from St. Paul’s Bay is Bugibba and Qawra, two of the islands main resorts. We didn’t make our way over to these coastline gems until our last day in Malta, and it’s a real shame we didn’t. These resort towns are brimming with shops, restaurants and activities, as well as significantly more people. The seaside promenade features a pool, basketball court, playgrounds and carnival-style games and rides. We had a quick lunch in Bugibba Square, where a majority of people were also dining, and then ended our experience with a visit to Sottozero gelato factory for some delicious creamy dessert. Our first full day in Malta was spent on the other side of the island from St. Paul’s Bay in the village of Manikata, known for its beaches. The beaches here are all situated in bays carved out of the cliffs by the rough currents. The most well-known beach is Golden Bay, one of the few sandy beaches on the coast of Malta. There is a smaller beach to the east of Golden Bay, called Ghajn Tuffieha Bay, which means Apple’s Spring. We heard about it from the driver who took us from the airport to the flat, and she highly recommended it. We actually opted for Golden Bay, despite it being larger and more crowded. We rented beach chairs and an umbrella for a nominal fee, and spent the afternoon lazing in the sun, catching up on our reading and toeing the water to cool off. There’s a café right next to the water, where you can order snacks and smoothies, or you can head up the hill a little way to a restaurant that serves larger meals and drinks. We ordered a pizza to share and a couple pints of Cisk, a local Maltese beer (not the best I’ve ever had, but we had to try it). We watched as the sun crept closer to the top of the water, shimmering with the last remnants of the sun’s rays. Another adventure took us to Meridiana Wine Estate and the city of Mdina. We hopped a bus over to Ta’ Qali in the center of Malta, and took a walk to the winery. It was late in the day, but we hoped they would still have tours or a tasting we could enjoy. With half an hour to spare until they closed, the woman at the front desk told us tours were finished for the day, but since we were the only ones there, she would be happy to give us a mini tour and tasting. What hospitality! We tried sips of the Astarte (a white wine Vermentino of Malta), Baltis(Moscato), Isis (chardonnay), Nexus (merlot), and Melqart (Cabernet Sauvignon & Merlot blend). I’m a big fan of red wines, but the whites really won me over here. They were crisp, with some floral and citrusy flavors. Since we knew we wouldn’t be able to find these wines in the U.S., we decided to pick up a couple bottles before we left. We took a way-longer-than-expected trudge from the winery over to Mdina (not something I would recommend doing). The ancient walled city was once the capital of Malta, and was home to the country’s noble families. Today, it still possesses a timeless ambiance, as if the world moved on without it, leaving it to flourish in quiet solitude. As we walked amid the impressive homes, the streets were empty. We wondered if we missed the memo that the city was actually closed. We did see some small groups here and there, visiting St, Paul’s Cathedral, poking in and out of shops, but for the most part, it was pretty quiet. Walking through the narrow streets, I definitely understood why the city was used as the setting for King’s Landing during the first season of Game of Thrones. Maybe it was the lack of activity—or the agonizing trek to get there—but I wasn’t that impressed with Mdina. However, it is definitely worth visiting, especially for medieval history buffs and architecture enthusiasts. Known as the Fortress City, Valletta is Malta’s capital, the heart of the island’s commercial industry. Built by the Knights of St. John in the mid-1500s, the so-called “city built by gentlemen for gentlemen” has become a World Heritage City and is one of the most concentrated historic areas in the world. A stark contrast from the area of Malta where we were staying, Valletta is abundant with both people and attractions. The moment we walked through the main entrance of the city, we were inundated with shops, restaurants, museums, historical buildings and more. It was tough to decide where to start first, and after grabbing some much needed caffeine and sustenance from a nearby café, we made our way to St. John’s co-Cathedral & museum. We felt it was a good place to start, considering the city has such a strong tie to the Knights of St. John. We paid €8 each for the entrance fee (it now costs €10) and a handheld audio guide that conveniently led us through the church and its many significant rooms and altars. Ladies be warned, if you’re wearing shorts, a dress or any shirt that shows your bare shoulders, you will need to use the shawls and wraps provided at the entrance to cover your shoulders and knees. I looked incredibly fashionable, let me tell you. The inside of the cathedral is incredibly beautiful, with intricate carved stone and painted high ceilings. The chapels were the most impressive, each of them dedicated to the patron saints of the Order’s eight langues and one for Our Lady of Philermos. The audio tour provides an extensive background for all of the chapels, which helped me understand the artistic depictions and symbols in each. After completing the audio tour (and browsing around in the gift shop), we left the Cathedral and walked down Merchant Street, filled with bars, restaurants and a flea market. We wandered over to Fort St. Elmo, and strolled along the waters edge, taking in the surrounding areas, before arriving at the Lower Barracca Garden and admiring the Siege Bell Memorial. 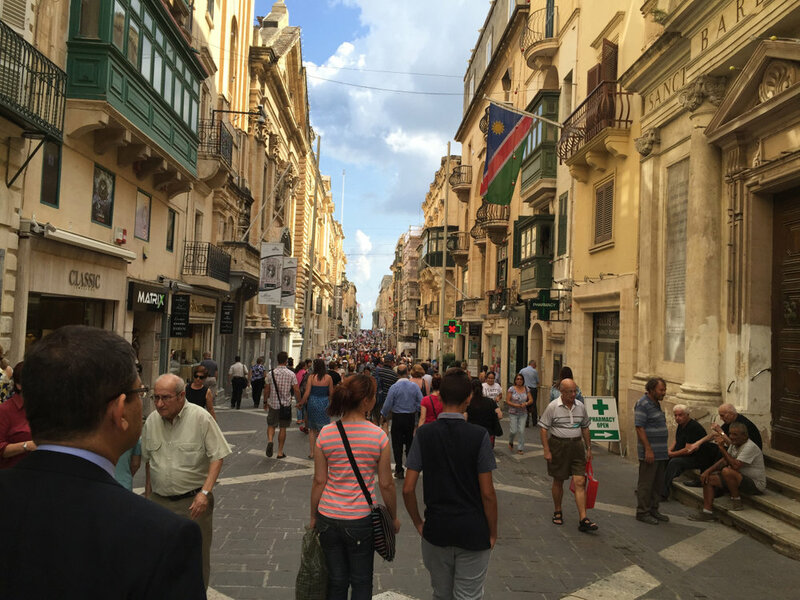 This is what I love about Valletta, it’s so easy to walk around the city. We grabbed a quick lunch at a place down a small street, almost hidden from the crowded main streets. If you’re visiting, keep your eye out for these hole-in-the-wall eateries—fewer people, great food and affordable! We spent a few more hours exploring the city. We visited St. George’s Square, located in front of the Main Guard Building and the Grand Masters Palace, and cooled off in the blasts of water shooting up from the stones. We took in views of the Grand Harbour as we sat in the Upper Barracca Garden, where I found my Grandma’s maiden name carved into a stone plaque—a sign perhaps? I picked up a few souvenirs—a ceramic cross of the Knights of St. John, a Maltese Falcon statue, and some Maltese candies—before we headed to the bus terminal outside the city walls. Since one of the main reasons we selected Malta was because it was a filming location for Game of Thrones, we knew we had to visit Gozo and its iconic Azure Window. (This is the setting for the Dothraki Wedding in Season 1.) Just a 25-minute ferry ride from Malta, Gozo definitely should not be missed. It is filled with incredible architecture and UNESCO world heritage sites, not to mention some unbelievable naturally formed structures and caves waiting to be explored. We didn’t rent a car, so we decided to do one of the hop-on, hop-off bus tours. We figured this was the best way to see most of the island, get some useful background and information about Gozo, and ultimately reach the Azure Window. Along the way, we stopped at the Xewkija Rotunda Church, the city of Victoria and St. George’s Basilica, a shopping village filled with all kinds of artisan crafts, before finally reaching San Lawrenz and Dwejra Bay, home of the Azure Window. This flat-topped rock arch reaches naturally over the sea. The geography was created thousands of years ago after two limestone caves buckled. Now, it’s a breathtaking sight that draws hundreds of visitors every day. We stood on the shore, navigating through shallow pools of clear water that had carved homes in the rock. It is the kind of place where you can just sit, perfectly content, listening to the waves and watching the blue water foam up against the rock. Next to the Azure Window is the Inland Sea, a small lake connected to the Mediterranean Sea by a narrow tunnel. This is a very popular dive sight, and is also a docking place for fishermen. We wandered over to the Inland Sea, and settled on the stony beach, next to several fishermen huts and boats. It was the perfect place to cool off from the heat, and we took a quick swim in the cool water before heading to the nearby restaurant for a nice lunch. On the way back to the ferry, we stopped at the Giants’ Tower, a megalithic temple. We heard good things about it, and figured it would be worth a visit. I consider myself a history enthusiast, but I wasn’t that impressed with the complex. The temples are basically crumbling structures, filled with rubble and the occasional rock formation that shows some form of civilization created this. I’m not sure it was worth money to visit, but I can now proudly say that I have been to the world’s second oldest manmade religious structure. These temples are even older than the pyramids of Egypt, so I guess that’s pretty cool. My experience in Malta reinforced the knowledge that every destination brings different elements to the table. You can explore a metropolitan city one day, walk through small towns and farmland the next, and finish the adventure at a naturally formed spectacle. Malta exposed me to a different world, one of immensely deep history, stunning architecture, entertaining culture and peaceful beaches. It’s a place worth visiting, and one I hope to return to very soon.